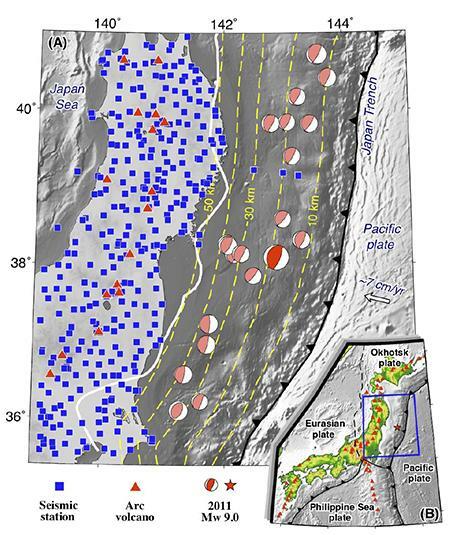 Researchers at Tohoku University's Department of Geophysics, have been studying the great Tohoku-oki earthquake which occurred on March 11, 2011, to the east of Japan's Honshu Island (Fig. 1). In Northeast Japan (Tohoku), the Pacific plate is subducting northwestward beneath the Okhotsk plate, causing the 2011 Tohoku-oki earthquake. Subduction is a process where one of Earth's tectonic plates sinks under another. To date, many researchers have investigated the causal mechanism of the Tohoku-oki earthquake, and a key question has arisen: Which plate controlled this huge earthquake? The upper Okhotsk plate or the lower Pacific plate? There have been conflicting results, because the detailed structure in and around the source zone is still unclear. The Tohoku University team, comprising Dapeng Zhao and Xin Liu (now at Ocean University of China), applied a method of seismic tomography1 to over 144,000 P-wave arrival-time data recorded by the dense Japanese seismic network (Fig. 1) to determine a high-resolution tomography beneath the Tohoku-oki region (Fig. 2). They also used seafloor topography and gravity data to constrain the structure of the source zone. Seismic tomography is an effective tool for investigating the three-dimensional (3-D) structure of the Earth's interior, in particular, for clarifying the detailed structure of large earthquake source areas. Using this method, the team received clear 3-D images of the Tohoku-oki source zone (Fig. 2), and showed that the 2011 Tohoku-oki earthquake occurred in an area with high seismic velocity in the Tohoku megathrust zone2. This high-velocity area reflects a mechanically strong (hard) patch which was responsible for the 2011 Tohoku-oki earthquake. This hard patch results from both granitic batholiths3 in the overriding Okhotsk plate and hard rocks atop the subducting Pacific plate (Fig. 2). 1 Seismic tomography: A method to image the three-dimensional structure of the Earth's interior by inverting abundant seismic wave data generated by many earthquakes and recorded at many seismic stations. 2 Megathrust: A great thrust fault where a tectonic plate subducts beneath another plate. The lower plate is called subducting plate, and the upper one is called overriding plate. In Tohoku, the upper and lower plates are the Okhotsk and Pacific plates, respectively. 3 Granitic batholith: A batholith is a large mass of intrusive igneous rock, larger than 100 square kilometers in area, that forms from cooled magma deep in the Earth's crust. Granitic batholiths are much harder than other rocks such as sedimentary materials. The authors wish to thank the data centers of the Japanese Kiban Seismic Network for providing the high-quality arrival-time data used in this study. This work was supported by research grants from the Japan Society for the Promotion of Science (Kiban-S 23224012) and Japanese Ministry of Education, Culture, Sports, Science and Technology (grant No. 26106005).